Nero Wolfe (1981): Mystery and Suspense on Television. William Conrad stars as Rex Stout's orchid-loving intellectual private investigator Nero Wolfe in this light crime drama set in contemporary New York City. His associate, Archie Goodwin, is played by Lee Horsley. Premiering as a mid-season replacement on NBC, the series lasted just one half-season of 14 episodes. 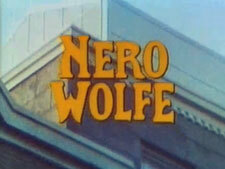 Nearly 20 years later, the character was featured in a somewhat more successful series on A&E, also titled Nero Wolfe.